Picture this: You’re a smuggler heading to and from Pakistan from Afghanistan, intent on making a quick buck without any regard for where your goods go. There’s a mix of assault rifles, ammunition and poppy in your shipments, but you’re letting the details take care of themselves. 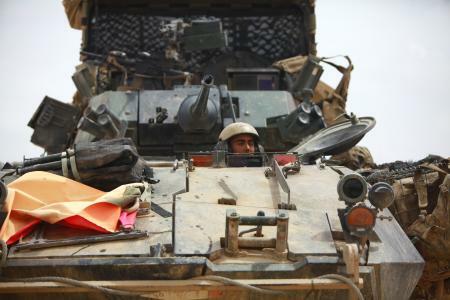 Then one day, your world gets shaken up: Marines in full battle rattle stop your vehicle with a Light Armored Vehicle, armed with a 25mm chain gun and two 7.62mm machine guns. They’re all business, and they don’t seem thrilled to learn your carrying contraband. Since November 2010, that has been the job of 3rd Light Armored Reconnaissance Battalion, out of Twentynine Palms, Calif. Patrolling the lonely open deserts of southern Helmand province, they’ve stopped thousands of vehicles, confiscating drugs, guns and ammo that fuel the insurgency. Soon, they’ll get a break. They’re handing over their terrain to 2nd LAR, out of Camp Lejeune, N.C., Marine officials say. Assumedly, LAVs will continue to patrol the desert, with headquarters at Combat Outpost Payne. As this recent piece points out, however, 3rd LAR wasn’t just based in southern Helmand. Elements of the unit provided security as a contractors built a road to war-torn Sangin district, officials said. Notably, they also conducted a series of raids in southern Helmand, seizing multiple weapons caches. One included $54 million in opium, weapons and materials used in improvised explosive devices. Much of the contraband passed through Bahram Chah, a remote border crossing in the hills near Pakistan, officials said. Third LAR raided the area in March, and will likely focus on taming it this spring.